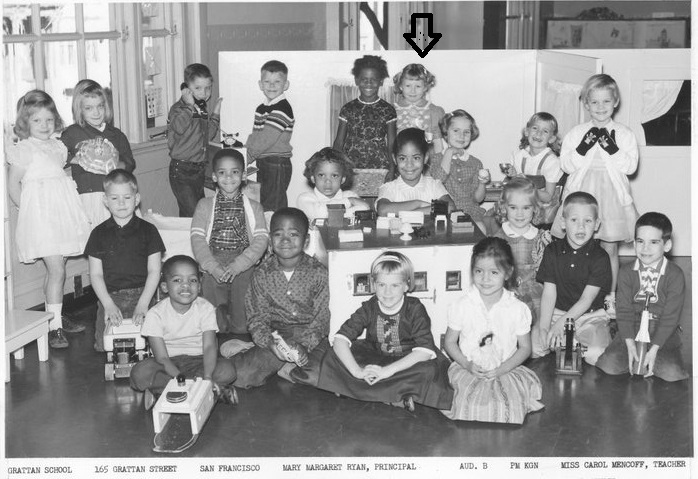 Public school in San Francisco was different from many of the schools, I later attended. They had Low and High grades and it depended on your birthday. I was a March birthday so when I entered school, I was put in High Kindergarten. Then in Jan, I moved up to Low First. We changed grades as well as teachers, twice a school year. Talk about stress! There were so many of us - kindergarten classes held all over the school. Mine was held in the Auditorium on the stage. In the picture, you can see behind the screen, another class in the distance. We also had a split playground. Boys on one side, girl's on the other. A fun game, I remember playing, was for some of us girls to play near the "LINE" and try and push a girl onto the boys side and the boys loved it. We did too. Yes, I called it a Laboratory and I called it that for years!!! I was confused. It was like I was stuck on stupid. People kept correcting me and I didn't get it. My school was brick and old. The bathrooms looked old and had this big sink with a rubber thing at the bottom, you stepped on and the water would spray out like a upside down fountain - to wash our hands. I used to play in that water all the time. I'd come back from the laboratory all wet. Everyone called it a lavatory. I heard lavatory but it came out of my mouth, Laboratory. When we moved from San Francisco and lived in Pacifica - the schools there were brand new - we had regular wash basins, no split playgrounds and we had bathrooms instead of lavatories or laboratories. "Please and Thank you" What a concept! Did they have a liberry? I learned the alphabet in Kindergarten. My favorite letter was lementopee. Yes I remember as a very young child, giggling when the lemontopee came up. Having high and low grades is brilliant. For so many kids they need a little gift of time in the beginning. Repeating high or low kindergarten is a good idea. Yeah I thought the low/high grades had something, especially when 2 of my sons were Autumn births. I held one back and the other slipped through and fell apart in the first grade,so I held him back from going into the 2nd. For me it was yellow. It came out as yeller. Now this is funny, I for many years as a child had no idea what a lavatory was, hell I thought it was funny to call the loo or toilet a restroom or bathroom, I remember as a child watching an American show and they called the toilet a bathroom and I thought how weird. I had a friend who had been a Navy brat - she always referred to it as the Head. We called it the lavatory in the late 60's 70's in NJ too. Split playgrounds? First I've ever herd of that concept.